“I am not an advocate of spending money unnecessarily, particularly when missionaries go in want. I am not an advocate of spending hours glued to a computer, when nursing home patients go unvisited. However, the enemy has pulled the wool over our eyes and too many will peek out only long enough to be spoon-fed by the dead T.V.. Examining foreign languages with a dictionary, plodding through Foxe’s history, or deciphering fonts from the 1500s is “study” (2 Tim. 2:15) and “much study is a weariness of the flesh” (Eccl. 12:12). BUT without some effort on our part, our children and grandchildren will be left with crumbs for a spiritual heritage. We each must “study” and “earnestly contend for the faith which was once delivered unto the saints” (Jude 3). THIS faith is there to see on this CD-Rom set, with the original gospels in 12 languages, as well as the rarely ever seen 8 volumes of Foxe’s history of the true Christian church. The Lord gave me a library of rare volumes; we could not help but share them with fellow Christians on these CD-ROMs. The cost of the books and the CD-ROMs' production by AGES Software, Inc.TM, which put us in the red, will be worth it, if fellowservants see it and “teach others also” (2 Tim. 2:2). a.) Search any name, word, phrase, or letter pair. It is better than an index. b.) Print out pages or chapters on 3-hole paper to insert in study notes or give away (see p. 2). c.) Cut and paste quotes into other documents. 2.) 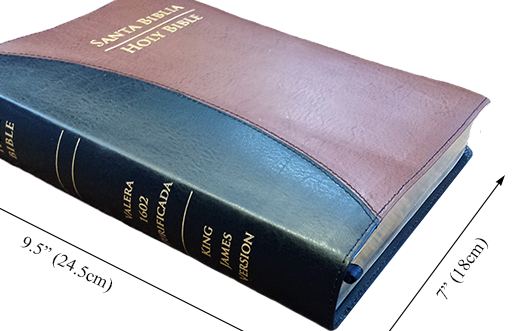 The King James Bible, searchable by words, letter groups and phrases. We wanted the KJB to interface with a searchsoftware that allowed the search of letter pairs (bl, st, etc. ); this software does it better than any other. You can cut and paste the KJV verses into other documents. This antique Polyglot is extremely rare; museums count themselves fortunate to have one page of it. Its previous owner was A. Gifford D.D., cofounder of the British Museum. Its price tag was well worth the secrets it revealed. It demonstrates the perfect agreement of the English King James Bible with all pure Bibles from other languages. It is perhaps the most important polyglot Bible in print because it was printed twelve years before the KJV and five years before the KJV’s translation work began. This is available nowhere else on CD-Rom, nor are copies or originals available for sale anywhere in the world. The Nuremberg Polyglot contains the Gospels of the New Testament in 12 languages, as they appeared before the King James Bible (approx. 1100 pages). The Greek, Hebrew, Syriac, French, Spanish, Italian, German, English, Bohemain, Polish and Danish match the KJV precisely and prove that the NIV, TNIV, NASB, NKJV, HCSB, ESV and NRSV are in error. This CD-ROM documents verse comparisons in In Awe of Thy Word, chapter 28. It is very valuable to own this Polygolt, even if you do not speak these languages. It is simple to show friends that words, such as ‘Jesus Christ,’ and verses, such as the last 12 verses of Mark, and the 16 or so verses omitted by most new versions, are in all the Bibles of the world. (An inexpensive paperback like, Harrap’s Five-Language Basic Dictionary will help you to compare many verses). It also allows the readers to document for themselves the agreement of the pure "scriptures... make known to all nations" (Rom. 16:26). It makes glaringly clear that new versions, such as the TNIV, NIV, ESV, NKJV, HCSB and NASB divert dangerously from "the word" given "in all the world" (Col. 1:5, 6). This is the rare, seldom seen, entire 8 volume set of Foxe’s Book of Martyrs, nearly 6000 pages long. It was originally written in 1563 ; this is the 1837-49 printing. Print a page a day for 16 years of daily devotionals. “OUTSIDE of being saved and experiencing that wonderful transition from darkness to light some 30 years ago, reading my copy of Foxe’s 8 volumes has been the greatest spiritual experience of my life. We put these 8 volumes on CD-Rom, that other Christians might benefit from this experience also. 5.) The Tome of the Paraphrases of Erasmus Upon the New Testament (1548-1549) with the New Testament text of the Great Bible (1540). ERASMUS printed an edition of the Greek New Testament Textus Receptus (available on another CD-ROM), because of this he has been the subject of many slanders. Erasmus’ commentary on the New Testament (the original English translation), valued at over $30,000.00 today, tells the truth about his beliefs. It has never before been make available on CD-Rom to everyone. These original antique volumes are a treasure God spared when Queen Bloody Mary charged that every copy of it be burned. The Erasmusian scholars at the world’s leading universities have admitted to us that they do not have access to this. Both volumes total about 1880 pages. Recent translations, re-typesettings, and reprints are highly unreliable. 1.) To allow Christians in these dark days to peak back to a more sober era through the eyes of one of history’s finest Christians. Erasmus was a very spiritual man; his humble spirit, piety, and zeal against error are refreshing. 2.) To show that Erasmus was not a Catholic when the whole of his views on the Bible are examined verse by verse. His comments make is very clear that he abhorred the beliefs and practices unique to the Catholic church. It is important to read it all, since Erasmus defines his own terms. (e.g. He defines baptism as the baptism into Christ (Rom. 6:3), not infant baptism). Critics who take snippets out and pose them in the lonely shadow of their own dark mind will show themselves to be poor scholars. Should his quotes be released, they will dissolve any false charges about Erasmus. King Edward VI. He commanded also that "the whole Bible of the largest volume in English and...the paraphrase of Erasmus" be placed in churches for, "every person to read the same as the very lively word of God" (Foxe, vol. 5, p. 708). Its preface shows strong Christian convictions and marked anti-popery; the Paraphrase of Erasmus shows strong Christian orthodoxy. Rare Bible collectors are offering for sale, Erasmus’ Paraphrases upon the New Testament [English translation], bound with an edition of the Great Bible. It is the only copy on the market today in the world. The price for this second edition is $26,000. God gave us the first edition (1548-49), which is now nestled away in a bank vault, but is available on this CD-Rom for all Christians to see. PC with Windows XP and Macintosh OS meet all system reqirements. PC with Windows 95/98/NT4: 486 processor (Pentium or better recommended) 16MB RAM (24 MB+ recommended), 10MB free hard disk space, NT4 should have Service Pack 3 or higher. PC with Windows 2000/ME: Pentium 90 or better, 32 MB RAM (64 MB recommended), 10 MB free hard disk space. Macintosh: PowerPC or better processor, OS 9 or better system software, 8MB RAM, 10 MB hard disk space.